The Zebra 2824: The easiest printers to load on the planet! Thermal transfer printing, 203 dpi, 2.25" print width, Ethernet and USB interfaces. Includes US Power cord. Interface cables sold separately. Thermal transfer printing, 203 dpi, 2.25" print width, Serial and USB interfaces. Includes US Power cord. Interface cables sold separately. Thermal transfer printing, 203 dpi, 2.25" print width, Parallel interface. Includes US Power cord. Interface cables sold separately. Thermal transfer printing, 203 dpi, 2.25" print width, Serial and USB interfaces, Dispenser. Includes US Power cord. Interface cables sold separately. Thermal transfer printing, 203 dpi, 2.25" print width, Ethernet and USB interfaces, Cutter. Includes US Power cord. Interface cables sold separately. Thermal transfer printing, 203 dpi, 2.25" print width, Ethernet and USB interfaces, Dispenser. Includes US Power cord. Interface cables sold separately. Thermal transfer printing, 203 dpi, 2.25" print width, Parallel interface, Cutter. Includes US Power cord. Interface cables sold separately. Thermal transfer printing, 203 dpi, 2.25" print width, Serial and USB interfaces, Cutter. Includes US Power cord. Interface cables sold separately. Thermal transfer printing, 203 dpi, 2.25" print width, Serial and USB interfaces, Real-time clock. Includes US Power cord. Interface cables sold separately. Direct thermal printing, 203 dpi, 2.25" max print width, USB and Ethernet Interfaces, Dispenser, and US power cord. Cables sold separately. 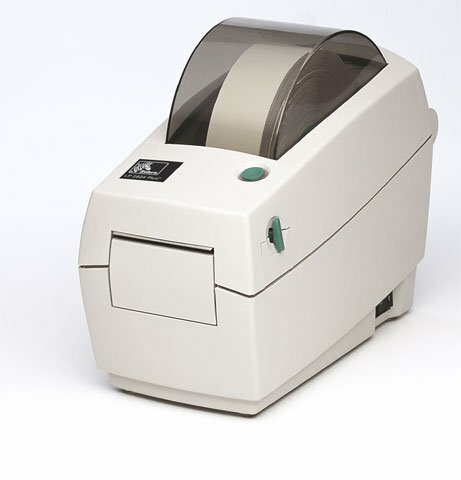 Direct Thermal printing, 203 dpi, 2.25" max print width, USB and Ethernet Interfaces, Real-time clock. Includes US power supply. Order cables separately. Direct thermal printing, 203 dpi, 2.25" max print width, USB and Ethernet Interfaces, and US power cord. Cables sold separately. Direct thermal printing, 203 dpi, 2.25" max print width, Parallel Interface, and US power cord. Cables sold separately. Direct Thermal printing, 203 dpi, 2.25" max print width, USB and Serial Interfaces, Cutter, and US power cord. Cables sold separately. Direct thermal printing, 203 dpi, 2.25" max print width, USB and Serial Interfaces, and US power cord. Cables sold separately. This is a great printer, easy to install, set up, and also printing was clear. We have several of these and continue to purchase more as we need them. I can't recall the last time we've ever had to have service or replacement due to failure. We stick with what we know and LIKE IT. We purchased this printer to label our equipment at a school. It does a great job of printing barcodes at a fast speed using the free software. I am very impressed by how many hundreds we have printed in a short time. The downside is since our school is Mac-based, we needed to bring in a PC computer to actually use the printer. (There are Mac softwares available, but they did not print in batches). I am very surprised that their developers aren't capable of making a simple app with these functions for a Mac. It's just a basic word processer with increment printing after all. They could easily hire a freelance person for a day to create it. Anyway, for our purposes it works great as is. It's just a shame that we had to dish out another 200 bucks for a basic PC to print the labels. Other than that, it's terrific. We use this printer for a preset tooling machine and print over 250 labels per shift, its been in use for alost two years with no issues! You get exactly what you paid for. We use the product in medical laboratories, and it always performs well. We LOVE this printer, wish I had ordered it months sooner! This has made pricing and labeling inventory a cool breeze, and looks so much more professional than any other pricing method. AND it is cohesive with Point Of Sale. Its like having another employee to have all this technology working for you! Zebra number 1 label printer. The Zebra TLP 2824 and 2824 Plus are the best label printers I have ever used. Used for school asset tags to inventory IT equipment such as PCs, servers, WiFi access points, software, and peripherals. I was really happy with barcodesinc customer service and products. The printer is perfect for our small high end boutique because of it's ability to print on small, discreet labels. I would defiantly purchase again. Good product! Well worth the money! EASY TO UNDERSTAND ESPECIALLY WHEN PUT IN USE IN THIS REMEOTE PART OF AFRICA, THE TECHNICIANS HAD NO TROUBLE TO ADAPT TO IT. WE LIKE THE QUALITY OF ITS PRINTS ESPECIALLY WHEN DONE ON ZEBRA BRAND LABELS. wE ARE ORDERING MORE PRINTERS. Technology made simple, great staff. I print barcode labels for all my products. We were shopping for a printer to print labels for some smaller products. We had ZERO experience in this area. Barcodes inc was extremely helpful and very knowledgeable. They recomended this printer and they were spot on. Prints great, high quality labels. We use this for our small business. It takes up very little space on our already cramped desk. Easy to us and set up. We use it with the zebra barcode software and a motorola barcode scanner and the set up works well for our growing business. I use this printer to place barcode labels on items read by robotic automated systems in a DNA laboratory. Works well for what I use it for. Has a great selection of label types for different applications.